The importance of waste disposal management is a very essential and integral part of any health care system. Health care providers have been ignorant or they did not essentially know the basic aspect of the importance and effective management of hospital waste.This overview of biomedical waste disposal/management gives a thorough insight into the aspects of the guidelines to be followed and adopted according to the international WHO approved methodology for a cleaner, disease-free, and healthier medical services to the populace, i.e., to the hospital employees, patients, and society. One of the main causes for the spread of infections and disease is the improper disposal of waste. It is a health hazard for hospital employees, patients, and society. Hospital employees come in close contact with infected tissues, biological fluids, and infected materials of patients. Similarly, doctors, nurses, labor staff, and technical staffs working in laboratories face the risk of accidental infection. There is a possibility of nosocomial infection. It is a common practice that many hospitals, nursing homes, and health care centers dump all the waste at the garbage collection site from where the garbage is taken away by the vehicles for final disposal. Most of the sites are prone for ragpickers who may get infected while handling such infected items. The items picked up are often sold to the market where the concerned persons tend to recycle the used needles, syringes, gloves, discarded drugs,  etc. Those who use these items face the risk of infection. Biomedical waste: It indicates waste material which is generated during diagnosis, treatment, immunizations, research, slaughtering of animals, and veterinary practices. Medical waste: It means any waste which is generated in diagnosis, treatment of human beings, immunizations, treatment of animals, research, production of biologicals and testing of biologicals. Critical waste: Waste generated as a result of medical care in hospitals, nursing homes, diagnostic centers, laboratories, domiciliary care. Pathological waste: This includes human tissues, human organs, and body fluids, containers which carry above-mentioned items during surgery, other medical procedures, autopsy, and anatomy dissection. Infectious waste: It means any waste which can transmit bacterial/viral/parasitic infection, even infected animal waste. Hazardous waste: This is hazardous but not infectious, and includes radioactive substances; chemicals, liquid, gaseous, vapors; pharmaceutical waste, cytotoxic drugs, outdated drugs, etc. Noninfectious waste can be recycled. Segregation is carried out at the site of waste generation, e.g., wards, operation theatres, ICUs, stores, pharmacy, autopsy room, etc. (a)	Yellow: Yellow plastic bags are used for segregating human anatomical waste; dissected parts; tissue removed at surgery; aborted fetus; laboratory cultures/specimen; items contaminated with blood or body fluids, i.e., dressing material, cotton, bandages, etc. ; animal tissue and carcasses (used in experimental laboratory). Method of disposal: Incineration/deep burial. (b)	Red: Red plastic bags or disinfected containers are used for segregating laboratory waste; culture plates; items contaminated with blood; nonsharp disposable items like gloves, catheter tubings, intravenous sets, etc. Method of disposal: Catheter tubings, etc. are shredded to prevent reuse. After shredding, they are disinfected by autoclaving, microwaving, or using chemicals. Finally they are sent for incineration. (c)	Blue or white translucent plastic bags: Puncture-proof container-like empty cans or thick cardboard boxes to store sharp items like needles, syringes, scalpel blades, broken glass items, etc. 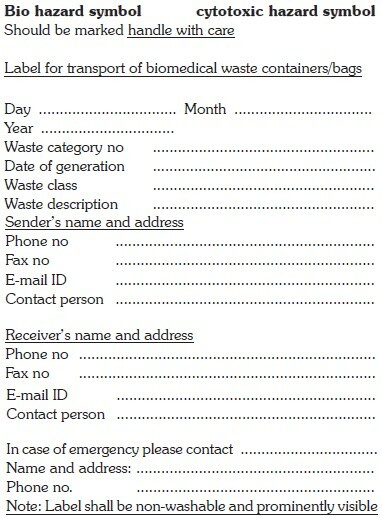 Method of disposal: After shredding these items, either autoclaving, microwaving, or chemical treatment is carried out. The waste is then sent for deep burial or incineration. (d)	Black: Black plastic bags are used to segregate discarded medicines; cytotoxic drugs; chemicals which have been used for disinfection; insecticides; incinerated ash. (e)	Liquid: This waste is disinfected and discarded in drains. (f)	Radioactive waste: This waste is hazardous. It is stored in lead containers in the basement of hospital buildings for a 3- to 6-week period for the radioactivity to disappear. After this period, it is discharged into the drains. To render infectious tissues free from pathogenic organisms, disinfection  is carried out before transporting and disposing them. Use of microwave: A small microwave is used for small quantities of laboratory waste. Larger units are required for large quantities of waste. Grinding, steam spraying, microwave irradiation are used. Until adequate quantity accumulates, the waste needs to be stored at the site where it is generated. It is necessary to have security at this place to prevent unauthorized persons and ragpickers handling the waste material. If the hospital has its own disposal site (incinerator), the waste can be sent there by proper garbage trolleys. Treatment of waste is the process which modifies the waste in some way before it is taken for final resting place, namely, disinfection; bailing and size reduction; and shredding to make the recyclable item unusable breaking the tip of syringe, needles, etc. The transportation of the garbage can be within the hospital (internal) and from the hospital to the final disposal site (external). From different areas of the hospital, segregated waste bags are sent to the dumping place of the hospital. Trolleys/carts used for transporting the garbage should not be used for any other purpose. Persons carrying garbage should wear disposable plastic gloves. Spillage must be avoided. Note that vehicles carrying hospital waste should not carry general municipal garbage. Final disposal of waste depends on its category. Noninfectious waste like papers can be recycled. Biodegradable waste can be used for landfill or vermiculture or can be just buried. Infectious solid waste is incinerated. Infectious liquid waste is disinfected and flushed out in the drains. Refuse can be disposed of hygienically by burning or incineration. It is the method of choice where suitable land is not available. Incineration is not a proper method in India as the refuse contains a fair proportion of fine ash which makes the burning difficult. A preliminary separation of dust or ash is needed. All this involves heavy outlay and expenditure, besides manipulative difficulties in the incinerator. Burning has a limited application in refuse disposal in India. Chlorinated plastics shall not be incinerated. The secondary chamber gas residence time shall be at least 1 s at 1050 ±50°C, with minimum 3% oxygen in the stack gas. Toxic metals in incineration ash shall be limited within the regulatory quantities as defined under. The hazardous waste (Management and handling rules) 1989. Only low sulphur fuel like L.D.O/L.S.H.S/Diesel shall be used as fuel in the incinerator. 1. Agamuthu P Post-closure of landfill: Issues and policy. Waste Manag Res 2006;24:503-4. 2. Meyers GD, McLeod G, Anbarci MA. An international waste convention: Mmeasures for achieving sustainable development. Waste Manag Res 2006;24:505-13. 3. Poonam Khanijo Ahluwalia and Arvind K Neema. Multi-objective reverse logistics model for integrated computer waste management. Waste Manag Res 2006;24:514-26. 4. Gupta S, Boojh R. Biomedical waste management practices in Balrampur Hospital, Lucknow, India. Waste Manag Res 2006;24:584-91. 5. Block SS. Disinfection, sterilization and preservation. 5 th ed. Lippincott Williams and Wilkins publication; 2001. 6. Hφrsted-Bindslev P. Amalgam toxicity - environmental and occupational hazards. J Dent 2004;32:359-65. 7. Chitnis V, Chitnis S, Patil S, Chitnis D. Solar disinfection of infectious biomedical waste: A new approach for developing countries. Lancet 2003;362:1285-6. 8. Environmental protection agency 1991-Medical Waste Management and disposal. Noyes Data corporation. Biomedical Waste (Management and Handling) Rules 1998: Gazette of India extraordinary, Part II, Sector-3, Subsections II), 1998. [last dated on 1998 Jul 28]. 9. Mehta G. Draft Guidelines for Hospital waste management; GOI/WHO Project; MOHFW, New Delhi: 1999.